A perfect gift for new parents to have on hand when baby comes home from the hospital. The Puj Tub fits in most hand basins and can often be moulded to fit. It can be adjusted so baby can be in a lying position or upright in a sitting position. Since it is at a workable height for parents it makes bending and/or kneeling unnecessary which is an added advantage to those with back or knee problems. The elevated height is also conducive to improved interaction and communication making bathtime a happy occasion. Set up is easy ... just fold the foam bath in two places and the magnets snap together. Once the Puj is folded, it creates the contoured bowl-type shape that baby sits in. The perfectly placed drain holes keep the water flowing through the tub so the dirty soapy water rinses out. The Puj Tub is safe because baby's head is always above water. 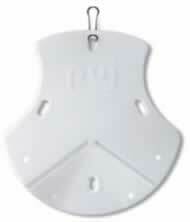 There is no risk of slipping down because the non-slip surface grips and holds baby in place. Since the Puj Tub can be flattened, it is easy to pack into a suitcase when travelling. Ben and Katie met at design school, later married and worked in competing design firms designing numerous products for companies such as Proctor & Gamble, Nike etc. Then they turned their attention to designing their own products which are specifically geared towards their own needs and those of their children. The design intent was to make babies feel like they are being cradled in the warmth and security of their parents' arms because that's when they are relaxed and at their happiest. So Katie designed the Puj Baby Bath Tub to hold a baby in the same position. Being cradled helps them to relax and enjoy the bath. And so can you! In a traditional bath tub, you need to hold the baby while bathing (or trying to do so). This means you often end up holding with one arm and bathing with the other. With the Puj, the baby is supported in an upright position and is not slippery as when being submerged in a regular bath. 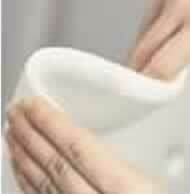 This allows you to use both hands for bathing. The Puj is made from EVA foam which is a super-soft, light-weight, flexible, non-slip PVC and BpA free material. It is shaped in such a way that it wraps around the baby's delicate, sensitive body. The surface is not cold so it also protects their skin from cold surfaces, keeping them insulated and warm. 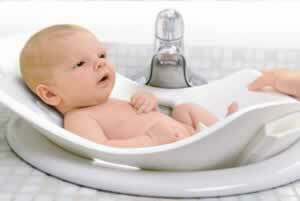 The Puj Tub has been approved by the Association of Women's Health, Obstetric and Neonatal Nurses (Washington DC USA).